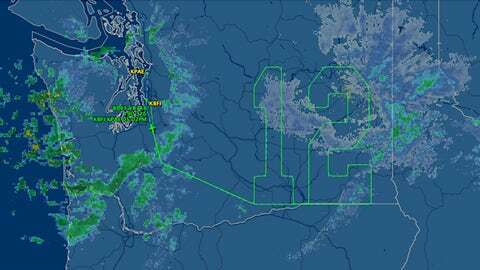 If you happened to see a Seattle Seahawks-themed jet flying circles around eastern Washington today, don’t be alarmed – it was simply tracing the shape of a No. 12, in honor of the Seahawks’ "12th Man" fan group and the team’s appearance in this Sunday’s Super Bowl. The flight map of the Boeing flight as it traced out a No. 12. 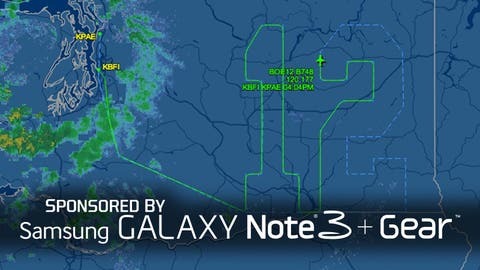 As it turns out, the aptly named Boeing Flight 12 isn’t the only Seahawks-themed flight taking to the skies this week. Alaska Airlines is embarking on a special flight Saturday in a 737 decked out in team livery, as well. But as fan tributes go, this is about as cool as it gets. • After Colin Kaepernick’s latest comments about Richard Sherman, the next game between the 49ers and Seahawks should be interesting. • One Seahawks cheerleader is also a first lieutenant in the Air Force. • The Brooklyn Nets will reportedly target Kevin Durant when he becomes a free agent in 2016. • Austin Carr’s retired jersey banner at Quicken Loans Arena has gone missing. • A New York steakhouse is offering a $150K Super Bowl meal. • Marcin Gortat wants to bring short shorts back to the NBA. • Russell Wilson, football player, will be featured on a baseball card this spring. • Could a "Major League 4" film be in the works? • Vin Scully will travel to Australia to broadcast the Dodgers’ season-opening series against a bunch of kangaroos the Diamondbacks. • The Waste Management Phoenix Open made a giant, floating sign out of 140,000 used golf balls. • The Chicago Blackhawks had a baby boom. • Wayne Gretzky, noted Canadian hockey player, was named to Teen’s Digest’s list of most athletic Americans. • The Blue Jays plan to install real grass at Rogers Centre by 2018. • An SUV that slid into a Denver lake this week might be connected to a local championship boxer. • A construction worker was killed at the site of Baylor’s new football stadium. • Former Nebraska quarterback Taylor Martinez designed an iPhone app.